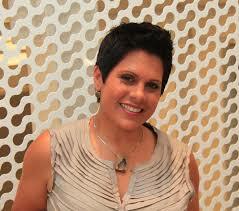 This week please welcome guest blogger Sajida Davis, teacher of Language Arts at City Neighbors Charter School. Where is the best place to read and write for adults in the world? Is the space I have in mind feasible for what I want to do, what I teach, and how I teach? What do I want students to think of and feel when they enter? What will I have to give up or let go of in order to attain this? What will I do differently for the space to be real (rules and procedures)? And of course – What will it be called? After I realized that the space I was moving out of and the space I was moving into were probably the same size, I realized that I did not want to take all the desks and chairs upstairs with me. The new space has carpet and feels more like a gathering or meeting space. So, I immediately thought of a cafe style of setting. I love to read and write, or just people watch at Starbucks and Barnes and Nobles. So, I decided that I wanted to create a very comfortable space with big seats and chairs for my students. A Cafe like setting. Lets call it Giovanni’s Cafe′! I wanted the authority in the room to not be noticeable and wondered if any was needed at all. Would the students to be on task working and learning in the new cafe′ like setting if I gave up the command center at the front of the room? I knew that in order for these things to work, to have the cafe that I imagined, I would have to give up a few things – and now I realize what they are. Giving up the traditional set up of desks and chairs caused me to submit to the space my authoritative position in the room. There is no “front” of the room in Giovanni’s Cafe. I’ve learned a lot this year about the authority of the classroom. Now, students are allowed to move about the room on their own and without permission. Students are also allowed to go to the restroom and for water without permission. (You wouldn’t need permission at Barnes & Noble.) 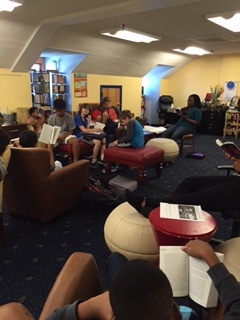 Over this past school year the students and I have become used to our new setting. We use the space for performances and open mic’s that are sometimes planned and sometimes happen just naturally (like it might at a “speak easy”). The space is laid back and relaxed, a place where I often hear students having open cypher-like conversations on current events and topics they’re passionate about. When it gets too loud, instead of telling kids to stop talking so loud, I play music in the background, and just slightly increase the volume of the music (which grabs attention), then turn it back down. Because they are so used to the music being in the background, this cue allows them to know when to bring it down. Teaching from the front of the room? Those days are over. I now teach from one of the big comfy seats and converse with the kids. I stand in front only as another presenter that is “informing” them and offering notes. Even the walls are used differently in Giovanni’s Cafe′. I now have a whole wall that is a white board. Student-artist work always lives here and is welcome. Students know that this is a wall that WE all use to present works, it isn’t just for the teacher. Now, the management of this space is in the quiet unknown procedures that we all support and enforce together. These new procedures allow me to focus on the work of my students and have extended time to really talk. And, I think that it has also changed my relationships with my students. They come to talk to me all the time now. They are very comfortable just lounging in the cafe during recess or when there is no class, just to work on school work or whatever. 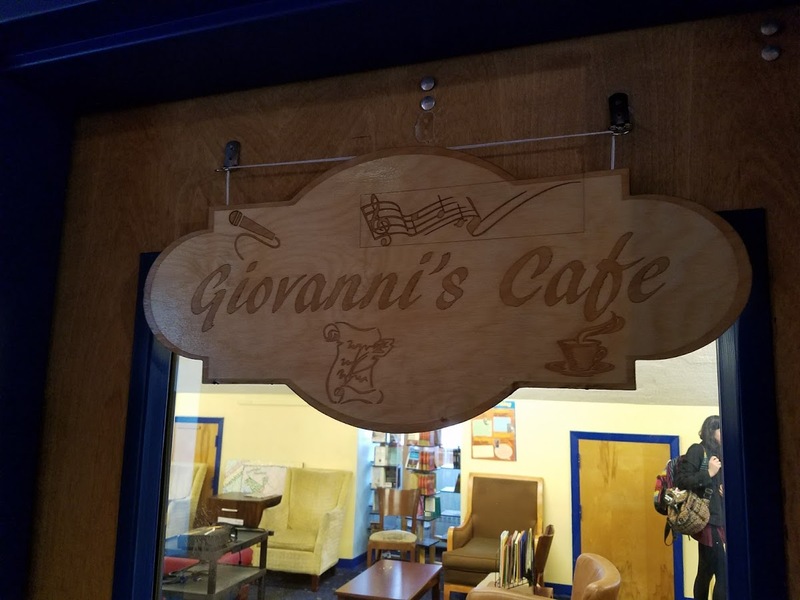 Now, I couldn’t imagine teaching in any other space but Giovanni’s Cafe′.